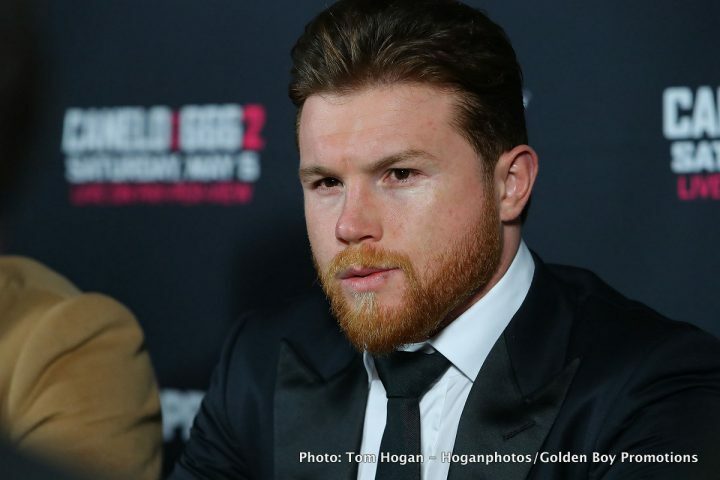 By Dan Ambrose: Abel Sanchez says it’s going to be much different in the rematch between Gennady Golovkin vs. Saul Canelo Alvarez when it comes to the percentage of the revenue for their fight in September. Sanchez wants Canelo to accept that, and get off his high horse and start admitting that it was him that messed up by testing positive for clenbuterol last February. Sanchez doesn’t know how the clenbuterol got in Canelo’s system for him to test positive, but he thinks he has to accept responsibility for that happening. Well, it’s clear that the percentage split must be different from the first fight last September for the rematch to have any chance of taking place. Canelo’s negotiators at Golden Boy Promotions where able to get Golovkin and his promoter Tom Loeffler to agree to a 70-30 purse split. From the outside looking in, it seems there was a failure in the negotiation process on GGG’s team’s part in ever agreeing to a purse that lopsided. Loeffler wasn’t even able to negotiate a 40 percent split, and he clearly deserved more than that. 55-45 would have reasonable, but 70-30 was a complete disaster. That’s a split that’s not far from what you would see a mandatory challenger getting against a champion. I know Canelo isn’t a world champion, but the split was horribly bad for Golovkin. The controversial 12 round draw made it a horrendously bad outcome for Team GGG, from the negotiations all the way to the results of the fight. Agreeing on the purse split is going to be very difficult for the two fighters. If Sanchez is waiting for Canelo to admit to the boxing public that he was wrong, and that he shouldn’t have been so careless as to eat meat in a restaurant in Mexico, I think he’s kidding himself. Assuming that Canelo and his promoters choose to stick with the 65-35 split that they had an agreement from for the May 5th fight, I don’t think the rematch has any chance of happening. Golovkin feels wronged with everything that’s happened with Canelo, and he’s not likely going to give in unless Loeffler talks him into accepting a lower figure than the 50-50 that he’s asking to get for the fight. I wouldn’t be all that surprising for Loeffler to try and get Golovkin to come down to a 60-40 split. I think Golden Boy would be happy to agree to that wide slit, because it’s still insanely uneven. For what Golovkin is bringing to the fight, anything less than a 50-50 split is grossly unfair. If the judges had scored the previous Canelo-GG fight as it played out inside the ring, Golovkin would be the one asking for a bigger purse split for the rematch. The draw was a horrible outcome, because it allows Golden Boy to give very little of an increase in the purse split to Golovkin. Sanchez thinks it’s odd that the boxing public wasn’t told ahead of time that Canelo was going to be given a hair follicle test. He thinks they should have announced that the test was going to take place so that the fans would wait on the results on a specific date. Instead, the test was done without the public knowing about it, and the negative results were announced afterwards. Sanchez wonders whether the results would have been revealed at all if Canelo had tested positive for clenbuterol in the hair follicle test. “When they did the test (hair follicle), they didn’t say they were doing the test,” Sanchez said. ”They announced the results,” Abel Sanchez said about the Nevada State Athletic Commission and Golden Boy Promotions not telling the boxing public about Canelo taking a hair follicle test. They announced the results but didn’t let fans know ahead of time that the test was going to be done. “If you want to proclaim yourself as innocent…’Listen, I’m going to go take the test tomorrow and in two weeks you’re going to get the results.’ They don’t announce nothing, and they waited until the results came out. That’s kind of fishy to me. What if he was positive? Would they have announced that he took a follicle test? of course not. For people that do something wrong, they have a time table where they can clean themselves in so many days to be able to pass a test if you’re being directed by somebody that knows. They know when to take it, when you cycle out. Hopefully, he’s consistent with the VADA testing he’s doing,” Sanchez said. It was odd that the fans weren’t told that Canelo was going to be given a hair follicle test, because that’s something that they should have been told about ahead of time rather than afterwards when the test was negative. Sanchez plainly doubts that the results would have ever been released if Canelo had tested positive for clenbuterol with the hair test. “All those rules in any other sport is you’re responsible for what goes into your body,” Sanchez said. “So to me, it’s intentional, because you’re responsible,” Sanchez said about Canelo’s two positive tests for clenbuterol. “To put yourself in that position when you have a big payday coming up, to eat supposedly tainted meat and test positive, that’s either ignorance or not caring or guilt,” Sanchez said about Canelo. It was a huge mistake on the 27-year-old Canelo’s part to take the risk of eating meat without knowing where it came from. That’s assuming that his story about eating tainted beef is a valid one and not something that he came up with to explain away his two positive tests for clenbuterol. “They’re good fights for Golovkin where he wins convincingly,” Sanchez said about the other top contenders – Daniel Jacobs, Jermall Charlo and Sergey Derevyanchenko – as possible opponents for Golovkin. Sanchez thinks Golovkin will have no problems beating Jacobs, Charlo and Derevyanchenko convincingly. Golovkin is going to have to be a lot more aggressive against them than he was in his two fights last year against Canelo and Jacobs. GGG choosing to box his opponents makes it too easy for the judges to take charge and put their own slant on what took place. Golovkin is going to need to be a lot more aggressive in the future if he wants to keep from getting beaten sooner or later. “Supposedly now he’s signed up for VADA, but all these days that he wasn’t, who was keep track,” Sanchez said about Canelo. “He’s never been in the WBC’s Clean Boxing Program, and yet he was rated by the WBC. I think that’s a double standard. I think Golovkin sees all these things. I think Gennady would be retired now [if he tested positive rather than Canelo], because it’s Canelo he did it against. When you do something to a named fighter, then you get put to the side. Golovkin would have been so maligned; he probably would have never fought again. I think he [Canelo] was forced into the VADA testing by the fans. I think this period of time will prepare him for the rest of his career. Whether it’ll be a good career and good relationship with the fans or a bad relationship with the fans, he could be bad guy or a good guy,” Sanchez said. I’m not certain that Canelo cares whether he’s perceived as good or bad. Since 2016, Canelo has been resistant to what the boxing public has wanted him to do. When they were calling for Canelo to face GGG in 2016, he turned around and vacated his WBC middleweight title and fought Liam Smith instead of Golovkin. That move caused Canelo to be viewed as a ducker by the boxing fans. All the excuses that Canelo’s promoter Oscar De La Hoya coming up with about him not having grown into the middleweight division weren’t believable to the boxing public. They saw how huge Canelo was for his fights after he would rehydrate, so they assumed that he was afraid of Golovkin and not willing to take a risk. When Canelo did move back up o middleweight after beating Liam Smith, he fought the faded Julio Cesar Chavez Jr. rather than Golovkin. It looked like Canelo didn’t want to fight Golovkin. « O’Sullivan says Canelo-GGG rematch will take place in September, he gets winner in Dec.